Kevin Pritchard, who has been part of the Pacers’ front office since 2011, is taking over basketball operations responsibilities for the team after Larry Bird decided to step down after serving as the President of Basketball Operations since 2003. Although Pritchard is rarely in front of cameras, he’s the engine behind the scenes. Bird has been steering the ride, but it’s Pritchard, along with other front office team members, working to act on it. Hopefully the information below will help in getting to know the 49-year-old. He was born in Bloomington, grew up in Noblesville, and his family once had season tickets to Pacers games at Market Square Arena. His family then moved to Kansas at 14. His childhood dream was to play at IU, but he never received a scholarship offer. He was the 34th overall pick in the 1990 NBA Draft, selected by the Golden State Warriors. He has a son, E.J., and a daughter, Kendall. And he is on Twitter (!!! ), @PacersKev. As General Manager, his role was to scout talent, come up with creative ways to improve the team and make it work under the cap, and primarily to execute Bird’s vision. He’s rarely seen without his phone in hand or glued to his ear. At home games, he sits in the first row next to Donnie Walsh when owner Herb Simon is not at the fieldhouse. According to several of his friends, Pritchard is a loyal friend with a giving heart. As a way to give back, Pritchard hosted a “How to be a GM” seminar in Feb. 2014 for four lucky Pacers fans and a guest each. More than 1,500 filled out an application to be considered. I was there (and wrote about it) and distinctly remember Lance Stephenson’s father also participated. His advice to those aspiring to work in basketball is to go work in the D-League and learn to do a little bit of everything. He has investments in several sport technology companies. He is an author. Pritchard co-wrote a book, “Help the Helper: Building a Culture of Extreme Teamwork” in 2012 with close friend John Eliot. He first hired Bill Bayno, now a Pacers assistant coach, as his player development coach in 2005 when he was named Trail Blazers interim head coach. 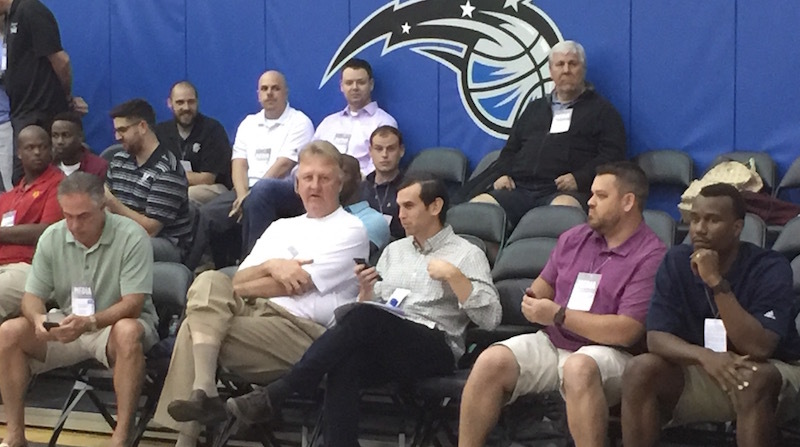 Pritchard (right) sitting beside Bird during Pacers practice. He played for Larry Brown at the University of Kansas from 1986-90 and won an NCAA Championship in 1988, led by Danny Manning — the National Player of the Year and first overall pick in the 1988 draft by the Los Angeles Clippers. KP averaged 12.2 points, 3.6 assists, and 2.5 rebounds per game over his four-year career. He spent time with the Warriors (1990-91), Celtics (1991-92), 76ers (1995), Heat (1995), and Washington Bullets (1996). He also had stints overseas in Spain and Italy. At 6-foot-3, he was an athletic point guard and wore numbers 2, 11, 12, 14. After his playing days were over, he first took a financial job in Kansas. Then, he coached the Kansas City Knights for two years and led them to an ABA Championship in 2002. Spurs architect R.C. Buford hired him as a scout for two years. He then joined the Portland Trail Blazers, first as the Director of Player Personnel. He later was promoted to assistant general manager (2006) and then to GM (2007). After more than three years in that role, he was fired by the Blazers on draft day, but still finished out the draft. Pritchard wrote an open letter to fans after his stint as GM ended. He drafted and acquired talent like LaMarcus Aldridge, Brandon Roy, Indy’s own Greg Oden (in 2007), Nic Batum, and Channing Frye. Injuries kept the team from winning like it could. He once was an NBA head coach, for the Trail Blazers … although it was on an interim basis after Maurice Cheeks was fired mid-year in 2005. 27 games (5-22) in total. Bird brought him on as Director of Player Personnel in 2011, and he was promoted to GM on June 27, 2012. For more on Pritchard, I recommend listening to this podcast from three years ago with Warren Central High School’s own Jason Whitlock.